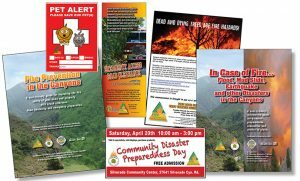 Commuinity wildfire programs HOW YOUR COMMUNITY CAN HAVE A WILDFIRE PREVENTION PROGRAM. HOW YOUR COMMUNITY CAN HAVE A WILDFIRE PREVENTION PROGRAM. Every community is unique and has different conditions, terrain, indigenous vegetation, evacuation routes and local support facilities. Comprehensive information, relevant to each community, in a user-friendly format has proven to be extremely effective because it motivates residents to read it, retain it and take appropriate action. In the wake of the wildfires that have decimated entire communities in California, there is a need to inform and educate residents on what they can do to prevent the spread of fires and most important, how to prepare for a disaster and what to do in case of a wildfire. While a lot of information is available from local fire departments and on line, it is generic and not specific to individual communities. This information is collectively found from one source. No one wants a pile of loose fliers, pamphlets and information sheets with irrelevant instructions. How can your community provide this type of material to your residents? It starts with interest from an active community organization. It may be your local Fire Safe Council, a Home Owners Association, or other Civic or Business Group that recognizes the importance to the community. Contact a specialist with the experience in developing, designing and producing this type of collateral. I have worked with communities in Orange County, San Diego, Potrero/Tecate, and Tustin to produce effective fire prevention programs and would be glad to answer all of your questions. Your program may include several facets and support elements like a website, email campaign, coordination with local events, etc. community wildfire educational campaign, Orange County California, Wildfire Evacuation. Bookmark. It is time for your annual business checkup.